If your relatives or your friends want to extend their 30 days tourist visa in the Abu Dhabi Emirate they have 2 options. You can go to the Residency & Expatriates Affairs office and pay 700 AED or You can do an Oman Visa Run and pay 35 AED upon UAE exit plus 5 Omani Riyals (48 AED) upon Oman entry. Oman exit and UAE entry is free of charge. I chose to do the Oman visa run from Al Ain (eastearn part of Abu Dhabi Emirate) through Mezyad Border for my mother-in-law. Not only is it cheaper, but you can repeat this process without restrictions. I have started the trip at 5:30 AM (from Ruwais) and have reached the Mezyad border at almost 9 AM. The road is (on average) smooth and clear. Before getting to the destination you will pass a (mountain) rocky areas and a few camel farms. Kindly remember to keep any papers that you are given at control points, you will need to present them later. Also, make sure your passports are valid for more than 6 months when you are doing the visa run. 1. Before paying the exit UAE fee (35 AED / person) you will cross 2 check points. Upon payment you will receive UAE exit stamp. 2. After reaching the Hafeet border in Oman, you will complete a form and pay 5 Omani Riyal using your credit card or cash. Upon payment you will receive Sultanate of Oman entry/exit stamp. While it is recommended to have proof of Oman coverage of your car insurance, the border police man told me that it is not needed if i am only doing a visa change. 3. You exit Oman border and go back to UAE border. Go the entry visa office to get the new 30 days Tourist Visa. Exit the border point and drive back home. I have finished all of these border crossings in one hour. I have have reached back in Ruwais at 01:30 PM. Going and coming back is a 700 km drive so make sure your car is in top condition. I look forward to your inquiries in the comment section below. Remember to share this article to someone close. PS. If you don t have a car, you can take the bus to Al Ain and from there you can arrange with mr. Rob Tyler to take you through the border and back. Can I get ur number to get more clarification on this as I would like to do it for my father who is on tourist visa here. Please send me an email and i will answer it with as much detail as possible. I want to do similar run for me and my wife both British, this weekend. I am In Abu Dhabi so Al Ain would be easier for us. So after going through the Ai Ain Mazyad exit, how far inwards is the Omani check-point or entry point? Can you do the Oman entry/exit at the same time and turn back from the same place? I will really appreciate a quick reply from you. Yes, you can do the visa run on the same day. I believe the attached photo gallery is very clear with that information. Just read your comment about the visa run. I need to extend my in-laws visas. We are South African and live in Umm Al Quwain. There current tourist visas was taken out by a company providing visa services. They are also the sponsors on the visa. Your urgent advise is appreciated. Usually sponsored type visas need to be canceled by sponsors before applying for a new visa. For more details please contact your emirate Residency & Expatriates Affairs to find out more about options to extend visa for South African tourists. Hi Ryan, Can you please confirm that these ‘visa runs’ are still accepted/allowed by UAE authorities. Last year I heard the news that these are no longer available for ‘western expats’ such as those holding British passports. Your response to clarify this issue will be greatly appreciated. I wanted to visit Muscut along with family for TWO days along with my family on 12th luly 2015. Shall I get the Oman border visa @ Alain- Oman entry. Is this visa run process valid for all countries? I mean to say is there any restrictions for any specific countries? We would like to go to Oman with my motorbike can i buy insurance on the border? Ryan can u send me the info about how to exit in oman boarder in al ain .. My visa is for employment and i have it already all i need to exit and go back again here in uae. What papers they need?? My sis 3 month visa expires in august. We need to get a need to extend it through oman border. she has kenyan passport. Please advise. How can u b so sure that this can be repeated without any restriction. I know this from experience with my mother-in-law. See the updated gallery photos. My mother-in-law has arrived in UAE – Dubai on the 7th of August with a 30 days Tourist visa. The second visa run has been done in Abu Dhabi – Mezyad – Hafeet on the 4th of October. (another 30 days). Total 90 days. No fines because we never passed the 30 days. Thanks for this very good information. Is this also applicable for 90 days visitor visa? No. Only 30 days tourist visa. now i am working in Dubai. (Indian),my profession is machinist/machine operator. Yes. If you have valid UAE residence visa you can visit Oman. I am a holder of Kazakhstan passport with a tourist UAE visa, now is ready my working permit for this reason i need to exit and entry back to UAE. Can I go for visa run to Oman boarder? You need work visa to exchange your tourist visa. Contact your company for more updated information and find out what is their preferred method of visa exchange. Can I ask where you got this list and this information from please? Is there an official website for this? The information presented in the article is from my own experience and from UAE/Oman official website. Good day sir.Is this also applicable if you go there exit in Oman and wait till your working visa is ready?…thank you. Yes, you can exit through Oman if you need to change your visit visa to a working visa. what is the process on exiting in oman?? ?is there any fee for oman visa???? actually i am a filipino citizen and preferred to exit in oman for changing my visit visa to working visa because my employer said that it is better to exit there in oman. how is the process and what are the requirements???? Dear Kayce please read the article and the comments to find the answers to your questions. Also, if your employer encourages you to do the visa run, he can surely confirm all the information that you will find here. how about saudi border at al sila? anybody have experience? Saudi border is much closer to Ruwais, but as far as i know : you need invitation to enter KSA. Last night I went for my friends visa exit/entry to Hili border in Al Ain. They told me to get Omani visa as well. since you cannot enter oman without the visa, and for exit and re-enter to be performed, you need to go to a country other than UAE. Now I’m looking for Oman visa and/or other economical options to do this process. Please help in this regard if anyone here knows it. Oman visa is on arrival. Depends on your nationality and what border you choose to cross. Hi – How far Is the Oman entry/exit stamp location from the UAE border post? Is it possible to walk this distance after parking your car on the UAE side? Thanks! The distance between UAE and Oman border is about half of mile. If you chose to walk during the day, make sure to take a bottle of water with you or a hat. My wife is on a tourist visa and i have got her residence visa and even paid 700 extra for the visa run process. Can you please confirm if i will be allowed to enter Oman for couple of days or i just have to do visa run process and come back. I am planning to do all this at Hatta Border. I will be accompanying my wife along so do i need to even get an exit entry stamp on my passport as well if i am just doing a visa run process only? 1. You do the Oman visa run (or any other country of your choice). 2. You pay a special fee (of around 500 AED) and your local Residency Authority will stamp your passport with the new visa on the spot. If you do the Oman visa run, you will pay the UAE exit tax and the Oman entry visa on arrival PER person (Oman exit and UAE entry is free). I have done the formalities. I just need to know if they will allow me to get inside oman for 2 days visit. By the way I am India. I have valid residency of UAE but my wife is currently on Tourist Visa and she is now going to change under my sponsorship. You may need to apply for the Oman visa in advance if you plan to make a 2 day visit inside Oman territory. Go Tours operate several trips to the border and back every day. The company has been around a long time and people in Dubai know it well. If you want a hassle free service at a great price please check it out. I guess you belong to Subcontinent countries. If so you need to get Oman visa before going there. I work at Global Visa run and I know it. Please check with Oman border Police for visa requirements. Returning to UAE will be no problem because you will show your employment visa. Looking at all the post on this site, I am sure you will be able to assist me. We are group family have planned to visit Oman from Dubai holding UAE Residence visit during this upcoming holidays. I have mine and my 2.5 yrs daughter visa valid till 2017. But my wife Visa is getting over next month (28/08/2015). And we have already booked the hotel and other arrangements in Oman. As I was surfing through the site and realised that the UAE visa atleast should be valid not less then 3 months. And I am worried if wife will be able to enter to OMAN due to her VISA issue. As I have visited the OMAN Consulate today and they have already stopped issuing the VISA being EID. Now my question is can I directly go to Al Ain or HATTA border and try and explain the officer the problem and request them to allow my wife to enter OMAN which we have planned only 4 days?? Coz… one of the attendant from asked me to try directly and if I am lucky officer may allow the visa for my wife since she is on my sponsorship. Alternatively is it possible I can go in advance to one of the Boarder and try it before we have actual planned travelling i.e. tomorrow. Your kind reply and URGENT suggestion is much appreciated. Your issue is only regarding your wife, you should go only to the Oman Consulate for an official solution. Visit them during normal working schedule. I was just told that cars with outstanding loans can’t cross the border into Oman any longer, as of like 10 days ago? If you are traveling with a personal old car to Oman, and you have valid insurance with Oman coverage, there is no issue. If you want to import used cars to Oman you will need to contact the Oman Border Police in advance to know if you are allowed. I bought the car brand new earlier this year, with 5 year loan. So this means under the new rule I can’t drive into Oman anymore with my car? How would they check? I am planning to go to oman by road through buraimi border for 4 days on 31st of December 2014. I and my wife and kids who are all sponsored by me have Abu Dhabi Resident Visa. I am an engineer by profession. My visa expires in May 2016, My families’ visa expires on 18th Feb 2015.I came to know from some people that the visa validity should be atleast 4 months to get oman visa at border. In this case will my family get oman visa at border since their UAE visa validity is less than 2 months. Would be very grateful if you could provide reply at the earliest. To my knowledge, in order to visit any country you first need your Passport to be at least 6 months valid. If you have already received visa for Oman or you are eligible for on-arrival visa, you can relax and plan your trip. For more updated information kindly contact Oman border police. i have mentioned in an earlier comment what countries are eligible for on arrival visas. once you get confirmation of your visa for oman, you can go ahead with visiting oman or just do the visa run for your friend. your residence visa of abu dhabi (uae) is your automatic acceptance to enter back in uae. My Tourist visa expired on 28th December and I want to get it extended from Oman Border. Do I have to pay any fine? I am planning to get it done on Saturday, 3rd Jan and I am a British national. There is a rumor of a 10 days grace period. I have tried to find it mentioned on an official document but could not. I will say that I have one European friend who is extending his tourist visa every 35 days. So far he has no penalties for overstaying. Please do not exceed the original 30 days unless you have valid reasons to do so. Im in freelance IT and have been living in Dubai for nearly a year. I do the visa run every 40 days via the Hatta border. My brother in law told me to call the dept of immigration to clarify this 10 day grace period. I can tell you now that after speaking with the helpful staff, they confirmed there is no such thing as an official 10 day grace period. BUT, that eligible nationalities have a maximum 40 days. The visa stamp at entry is always 30 days, but in the background we are allowed 40 days, after which we would get fined. I have been repeating the visa run inside 40 days for the last 6 months without any issues, and the Hatta border run is only 5 rials. Hope this helps everyone. If living in Abu Dhabi which Omani border post is faster to drive to? 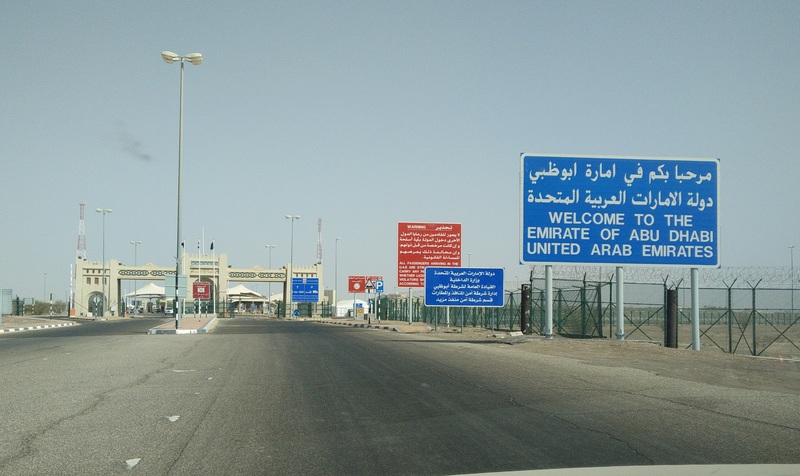 In my experience going through the UAE border at Al Ain – Buraimi you have to drive a further 40km to reach the Omani border post and then turn around to come back, whereas at Hatta – Al Wajaja the UAE and Omani border post are only about 5km apart from each other. Wondering if there is a way to do a visa run through Buraimi or this Meyan without driving 40km further. Hatta is closer to Dubai emirate. Hatta is the most know border point to do the visa run, and you may choose to use this one if you do not mind waiting in a crowd. Mezyad border is in Abu Dhabi emirate and is very close to Oman border control point. The distance between the two borders is less than 1 km. I want to know my wife came here tourism visa with me.i want to change to residents visa.she cannot travel bcz she is now pregnancy 3rd trimester. Kindly advise me without any exit can I get resident visa.. Need ur advise very urgently and pls help on this..
You will pay a special tax for changing the visa without exit. Regards and may the child delivery be easy. I’m a tourist here in dubai and i have plan to exit in oman, do you have any idea how much is the cost of oman visa change&transpo and the hotel rate per day or affordable package to stay there for 20days.Also if anyone here knows any information please help me.Thanks in advance. Your enquiry is best answered by a travel agency, since they can provide transport and hotel packages. Hi!Thanks alot for sharing.Need some confirmation.I have UAE residence visa. Once I exit UAE, do I need to pay for the Oman visa or I can just reenter UAE without Oman entry/exit stamp? I’m driving my sis for the visa run and I’m just tagging along with her. And in Oman what do my sis need to say to get both entry and exit visa at the same time?Simply tell them that she wants to reenter UAE? When i did the oman visa run i only payed for my mother-in-law Oman visa. When you are at the Oman border office, just say you are there for “visa exchange” and the police officers will know to stamp entry and exit on the passport. Simply tell them “visa run” or “visa exchange”. Thanks for the advise. Did the visa run today from AD.The whole process went really smooth and took less than 30 mins in and out the border. It is great to hear that everything was ok.
Can you share more details regarding your experience ? Are there any price modifications as of JAN 2015 ? Did your sister exceed the 30 days ? We did exactly as you did..went through the border, parked the car, there were actually 6 of us..my friends relatives were with us..and my husband was the only one who went out and took care of their passports. There were 2 booths that we had to pass..one was to check the car registration papers and another one to handover the passports and payment for UAE exit. My husband paid by credit card..AED 35 per person. Then, at the Oman checkpoint, everyone has to leave the car and go to the counters. First, go inside the building, approach the counter and request for the Oman visa form, fill the details, handover to the officer at the counter. The person in charge asked the reasons for entering Oman. Told him for visa change, he stamped the passport (entry and visa stamps) and told us to go to another counter at the opposite side for exit stamp. Payment..they accepted cash in UAE dirham. AED 50 per person.Just in case, have a credit card in hand. Who knows they might decided not to accept cash. Keep whatever paper they give. They will make a headcount and write on a piece of paper the number of person traveling in the same car. Return the paper at the Oman checkpoint booth upon exiting Oman.Exit Oman, head back to UAE. This time everyone had to leave the car to get the passport stamped for UAE entry. So it took less than half an hour for all of us. Only 1 km from each border.at that point of time, none of us exceeded the 30 days. But my sis did the visa run for the past year and exceeded the 30 days a few times. She usually did the visa run via Hatta and they were allowed up to 10 days late before they were imposed the fine.We went for a vacation last month to Oman and entered UAE via Hatta.The immigration told us that you are allowed to stay up to 40 days only if you exit via Dubai airport (or Hatta) but if you exit via Abu Dhabi airport they will only allow you to exceed up to 5 days. Well.. I don’t know how valid the information is because everytime you ask a different officer you keep getting different answers.The most my sis exceeded was 5 days and no questions asked. So for your benefit..if you really must extend the visa..don’t extend more than 5 days.Or just prepare the cash to pay the fines! Meyzad border is the closest and quickest from AD. AD to Al Ain with the visa renewed under 4 hours! Anyone who wants to do the visa run from AD, there’s a service every Friday morning..you can email to [email protected] for details. Very good detailed reply. I have a couple of questions if you don’t mind. Did you have to pay money also for the vehicle to exit UAE/ enter Oman? eg 80AED or similar. Can someone with a UAE residence visa accompany on the entire journey without getting their passport stamped (as is the case with Hatta) for example. There is no entry/exit fee at the border for your (personal) car if you are doing the visa run. Once you get passed the UAE exit border you will get your passport stamped. The only exception is at the Oman border, they will only stamp the passport that needs the new visa. Thanks for the reply, but not sure how that can work. Essentially I wondered if someone could reach the Omani border post without taking a UAE exit stamp in their passport. As far as Im aware, once an exit stamp from a country is issued, you must enter a new country before you can get a new entry stamp again. I have a residence visa and my sis came here with tourist visa. If you are a residence, you need to stamp out from UAE and pay Aed35.That will be the exit stamp. At Oman border, you don’t have to give your passport to the immigration. Just wait out while your family/relatives are done with the whole process. Then, turn around to UAE and get your passport stamped. As long as you are residence, you can go out from UAE and come back without entering any other country. I did this when I went to QAtar waited at the transit lounge and return to UAE without going out from the airport. As long as you have the exit stamp and entry stamp that should be enough. When you enter UAE (through Dubai) you are allowed to stay 30 days. There is a 10 days grace period – so you can overstay if you have an emergency. The grace period is not publicly mentioned in any document on the internet, so there is no official confirmation of it. You can do the Oman visa run again. There is a possibility to get a fine because you overstayed, but you can say you could not extend your visa because of x reason. Can I do the same thing if I want to cancel my wife’s tourist visa and get her entered into UAE again on Spouse visa? If yes, will I get Spouse visa at UAE border?? Ofcourse I will do it after all the documentation required for Spouse visa. First you will get a pink A4 visa for your wife. When you go to Oman (for visa exchange) and your return to UAE border, show the spouse visa to the police officer. You can also change from tourist visa to spouse visa at the Residency & Expatriates Affairs office and you pay an emergency tax of around 500 AED. I will do a similar procedure in the following month with my wife. I will change her work visa to housewife visa. I will update the article when i will finish everything. Hi ryan thank you for the information!! my daughter have a 30 days tourist visa and she need to exit on the 25 jan 2015, and i already applied her in a residence visa and soon i will recieve it the residence visa for her, and she is olny 3 yrs old, my plan is to make her exit and coming back to uae as soon as possible as we hold her residence visa going to oman for exit purposes only. 1. can we accompany with her doing the same you did? 2. how much it will cost for as we are probably 3 person including my daughter? 3. it is applicable to us this visa run to our situation? 4. and if where in al ain down town how many hours will take the hull journey? 3. Visa run is applicable for you : changing from tourist visa to residence visa. You can call Oman embassy to confirm if you are allowed Oman on arrival visa. Eligible countries have been mentioned above. 4. If you live in Al Ain, i think you can make the whole trip in less than 2 hours. It depends on traffic and how many people are doing the visa run on that day. @Ryan: Thanks for the info’s. I did this trip yesterday, and it is still works (we got the advice to goto to Hili and then drive for 40 kms, rather than Mezyad. However, Mezyad border crossing is open). I went from Al Ain to the border with bus 590 (4 Dhs, 45 mins). From there I walked to Oman and back. As I didn’t know where to go exactly (just ask around, all friendly folks!) it took me 1 hour and 15 minutes (that means, I just missed bus 590 back to Al Ain). Of this 75 minutes, I estimate I spent 30 minutes on walking. Thank you for the information Ryan!! Sorry if this is repetitive. Have you heard of anyone having troubles in a rental car without “Oman Insurance”??? From what I have read here, it seems that if this is a problem, I will be able to walk the distance between the border at Mezyad?? As far as i know you are not allowed to cross the border with a rental car. Yes, you can walk the distance between the borders at Mezyad. So just to clarify, the total cost to exit and re-enter the UAE is about 85Dhs? I’m planning to use my brother’s car to do this from Abu Dhabi. Using google maps, it seems it only takes about 2 hours each way. If you extend the visa from the department of foreign affairs, do you still qualify for the 10 days grace period? That s the correct cost for 1 person for the visa run. Remember to bring omani riyali or a credit card at the Oman border. If you extend at foreign affairs office, you have a strict 30 days extension. The 10 days grace period is not mentioned in any online official document. Your post is really helpful as I will be doing the same for my sister. She needs to exit the country next month since she’s in a tourist visa and wait for her working visa in Oman. The agency will arrange the trasportation but she will need to pay the hotel which is 40AED as per the agency. Is it safe for ladies to travel to Oman and stay in a hotel? Which hotel would you suggest for her to stay and tips whe she reache the boarder and during her stay. She might stay there for 2 days. Your post is really helpful as I will be doing the same for my sister. She needs to exit the country next month since she’s a tourist visa and she will wait for her working visa in Oman. The agency will arrange the trasportation but she will need to pay the hotel which is 40AED as per the agency. Is it safe for ladies to travel to Oman and stay in a hotel? Which hotel would you suggest for her to stay and tips whe she reached the boarder and during her stay. She might stay there for 2 days. I have not traveled to Oman for pleasure or holiday. I don’t know any hotels to recommend. 40aed is very cheap for one night stay at a hotel. I would not worry about about traveling as per agency directions. I would keep my passport, my money and my telephone very safe with me at all times to avoid any issues. I will be accompanying my friend for his visa run. I am resident visa in abu dhabi and Filipino citizen, and will be driving him into visa run. Do I need to bring with me any documents aside from passport and emirates id to for me accompany him all through out his visa run process? To do the visa run, simply bring your passport. You may also be required to pay upon exit at UAE border (bring cash or a credit card along). Additionally you can also make a copy of your car insurance with Oman coverage. my husband employment visa is cancelled..now he is in tourist visa n changing to new employment visa soon,,he will get his pink visa paper soon so he can do a border run to change the visa?..and do it require eye scanning as he enter with his new visa?and is the same charge for 85 dhs to enter n exit? or should he pay 500 dhs for the visa change? The cost of the visa run has not changed. A friend of mine recently extended the visa for one of his relatives. You are free to choose any method of changing from tourist visa to employment visa. This article merely presents an option for a particular case. I just would like to ask how many times can you actually do this visa run if you are on a european passport? Can i do this with a business visa and a 14 days visa? Visa runs mainly apply for tourist visa extensions. Accepted nationalities are listed in an earlier comment. For more details please contact Oman embassy. I was wondering is it safe to use the 10days grace period everytime you do the visa run? Thanks again! Really appreciate it. I would not recommend to use the 10 days grace period since the terms of it are not clearly mentioned anywhere online. Please try and have a valid reason if you get questioned at the border about overstaying in UAE. Please contact Oman embassy to confirm if you can do visa run. If you have the pink paper you are allowed to re-enter UAE without issues. His visa is expiring on 1st march. so is it possible . he exit on 1st mar to muscat and came back again on TOURIST visa. by taking a return flight . once he exit . Travel agent will post his tourist visa application. and get the tourist visa again in 4 hrs. Just want to know can he come on tourist visa again from oman. he is a south african national. South African nationals are not eligible for UAE on arrival visa. I don’t know if the travel agent can get the new tourist visa in 4 hours. Your friend may be unable to return to UAE. Please contact the Abu Dhabi Residency & Expatriates Affairs office for updated and official information. I , my husband my son and my mom in law have residence visa. My mother in law residence visa is done by my husbands elder brother. I need to go to oman to attend a function. Please make sure you are eligible for OMAN on-arrival-visa before making any plans. With regards to your inquiry: the presence of your mother-in-law’s visa sponsor is not required when traveling out and back to UAE. Once the residency visa is stamped on your passport you can travel freely. I will mention that you need to visit back UAE every 6 months to not get the visa cancelled. me and my husband on tourist visa in dubai pakistani passports we want to exitfrom oman border should we get visa on border check post or we have to apply from any agency. should we carry cash for the payments over their. we have employment visa`s. Just contact Oman embassy to confirm your entrance at the Oman border point. Coming back to the UAE should be easy since you have mentioned that you now have employment visas. Can you please confirm that the google map coordinates you linked are the Mazyad/Mezyad crossing? Other google searches for Mezyad show the border to be in the middle of Al Ain/Al Buraimi, quite a difference when planning a day trip in Oman. We’d like to explore it a bit. Any tips? Ryan , i am Fontawah a Cameroonian by Nationality. Please my tourist visa in the UAE is going to expire by the 16 of march , i wish to know how i can do visa change by entry Oman, and re-entrying the UAE with visit visa. I need to confirm whether Pakistanis can use the visa run option also. I am told by a few colleagues that Pakistanis can not do it. Please confirm. I am an Indian – now in Dubai on tourist visa valid for 30 days – till 30th March – Employment visa will be ready (visa as archives clerk (originally am an auditor/accountant – Degree certificate not received , so issued this)) – Can I do Oman Visa run for exit purpose? Kindly contact Oman embassy to confirm clearance at Oman border. Just helping out anyone who are interested to do visa runs from AD can email [email protected]. I used their service and they are great. They are a couple helping out their friends and now they are extending the service to those interested.I don’t need to do the run myself anymore! Your page definitely helped me and I just want to help others too by sharing this visa run service. I want some information. actually i am working as a Maintenance Manager in Transport LLC company in Oman. I want to go to Abu Dhabi. Can i go from Shikla border. please can anybody send me the detail of visa and fees. I did visa run on 8th of April, with my wife and my 7 months old boy. We only had our EU passports with us. My wife is now on tourist visa. She quit her job to take care of our son. I paid everything with credit card : 97 AED upon exit (for 3 persons) and 5 Omani riyali (for 1 visit visa for my wife). Does your son also have visit visa? Does your son also have visit visa? Do you know how many times you can make a border run? If there is a max amount for children? My son has residency visa. As far as i know there is no restriction for visa runs. If you are eligible for tourist visa then you can do visa runs ;). Can i go to oman for exit while im waiting for my working visa here in abu dhabi? How much is the cost of visa? Can i get it from the airport? I am here in UAE on Entry Permit – New – Long Term visit Single Entry – Tourism. Issued on 11-02-2015 from Sharjah. I was here in the search of Job which I has secured thankfully. No the thing is that my employer has provided me the Entry permit Visa which is valid for 60 Days. (Starting from 12-April-2015). My employer has told me that I will need to flip my visa from Tourism to Employment Entry. Please guide me whether I am eligible for the Oman Border visa change. I need to do a visa run from Abu Dhabi. I read from one of your replies that you recommend the Mezyad border passage, which is probably the closest one. Is it feasible if someone does not have a car? I read about Bob Tyler offering his services, but what if someone wants to take a taxi, walk through and then walk back (as they are not allowed to cross), is it feasible? Are there taxis available to take you back to al-Ayn once you’ve done? Is Hatta a better option if you don’t have a car and you don’t want to walk for 1km? Thanks for your offer. I’ll save your number, but unfortunately it’s not for this weekend, it’s for the one on the 8-9 of May, are you planning to travel with other people on those days as well? If you are interested, we will have a visa run on the 9th May at 8am. There will be a lady co-driver if we have any female passengers. Do you have to do the visa run on the last day of your visa or can it be done when you still have one week valid on your current visa ? I’m flying in to Oman for a visa run since my 30 days tourist visa in Dubai is expiring soon. Do you have any advice as to what I should expect? Does a person has to enter Oman? what if he gets the eixt stamp from UAE border only and returns after few minutes to enter UAE without actually entering Oman and getting their visa and then coming back. I just booked a ride for visa run with Ahmad on Friday the 15th from Abu Dhabi. We need some more passengers. If you are interested, please call him on 0566698280. I just want to ask, do you have any idea how much is the rate of the hotel per night? Is the first night free same with the hotels in Kish? Please let ne kniw as I am currently on a tight budget now. Thank you. Your blog is really informative & helpful. I just want to ask, do you have any idea how much is the rate of the hotel per night? Is the first night free same with the hotels in Kish? Please let me know as I am currently on a tight budget now. I heard once you arrive in the country you get 90days this is for Germans/ french i forgot the other nationalities. so no more border to border? does this mean u can’t do border to border after you used 90days? Just a small correction, but it is not the EU countries who get the 90 days, it is the Shengen countries. The UK is in the EU and does not get 90 days for example. I am planning to drive and bring my 2 kids from Dubai going to Hatta Oman border to get their Exit and Entry Stamp on their passport. They already have their Entry Permit for Residence Visa Change under my Sponsorship..Is it possible to do it in 1 day? hello there,.i want to go to oman for just 1 day.,and i planned to go by bus. but there is one thing that is bothering me,,its about the requirements. do i need to get a visa? I am planning on completing the border crossing with my wife, I currently hold a UAE residence visa, My wife was on a spousal visa with my previous employer, I cancelled this and due to an extended wait for my new visa she is on an overstay, She have to leave the UAE before we can apply for the entry permit. I have already been to the Omani Embassy and we have tourist visa stamps to enter Oman. I was planning on driving to as the car is a company vehicle and leased it will not have Oman coverage. My wife and my daughter is here in Dubai for 3 months visit visa (sponsored by me) and will expire on 13th July. I have a residence visa here and we are planning to exit in Oman and apply a new visit visa for them to re enter uae. Please i need ur advise. Exception to this rules are Filipinos with GCC residence visas. I am planning to have 2 days vacation in Oman, i am currently working here in Abu Dhabi as an Accoutant. Will there be any problem if i go in Oman and what are the documents needed? I am just worried if my working visa will be cancel if i travel to Oman. Just bring your passport. Your UAE residence visa grants you on-arrival visa to Oman. Thank you for answering my questions. Just an additional question, I am planning to take the Mazyad Border to be in Oman, will there be any payment in the border? I believe there is, but i have never been tested / iris scanned myself. now i am working in Abu Dhabi (Indian),my profession is security guard with PSBD license. Any GCC (UAE included) visa grants you the possibility of Oman on-arrival visa. I would like to visit Salalah, Oman for a 3 days tour in September, My passport is valid until 2024 and my visa is expiring in February, 2016. I would like to know whether I am still eligible to get Oman tourist visa at the Al Wajaja Border. My Profession is Engineer and it is approved profession list. Please advise whether my visa validity should also be not less than 6 months? When I go through you website it is telling me that is not less than 3 months. Please clarity whether I want 6 months residence visa validity or 3 months is enough. To be eligible for Oman tourist visa, you need a valid GCC residence visa and a valid passport with a minimum 6 months until expiration. Kindly contact Oman border officials for more details about what a “valid” GCC residence visa means. If Indians are on UAE Tourist visa but have a Residence visa processed and need to exit to get the Entry permit stamped, do they get automatic visa into Oman by road? I believe that you would not automatically get an Oman visa, since on your actual (indian) passport you do not have a residence visa stamped. What you do have is a pink entry visa for UAE, and after the medical test and uae id application you will get a residence visa stamped on the passport. OK, I will give my feedback in a few days time. So how about Indians with UAE employment visas stuck in their passports, can they enter and exit Oman by road and just pay 50AED for the visa? To my knowledge: UAE employment visa is part of the process of getting residence visa, done by your employer. It s like a work permit. Simply putting it, you cannot work and stay within UAE without a residence visa. Ryan- Great stuff here! Thanks! Do you know if it’s ok to drive a friends car across the border to Oman as long as its insured for Oman? I need to take my wife down and was just going borrow a friends car. Also, do you know if I will be able to do unlimited runs to Hatta? You can do unlimited visa runs if your country has a special on-arrival visa agreement with UAE (see the list mentioned in an earlier comment). I’m an American citizen and I already got visa extention. Can I still do the visa run afterwards to get another 30 days ??? if you have got an UAE goverment issued visa extension you cannot do the visa run. your employer should provide you with that information, it is in his best interest to speed the visa process. kindly contact oman embasy to provide additional information on your situation and find out the requirements for an Oman visa. I am working as an SAP HR Consultant in Abu dhbai. I want to visit Oman for 2 days. DO i get the visa on arrival or i have to apply visa. My Visa Status till 2017 and with profession Information System Consultant. I am working as an SAP HR Consultant in Abu Dhabi. I want to visit Oman for 2 days. DO i get the visa on arrival or i have to apply visa. Anyone doing visa run from Al Ain way to Oman (Mazyad past Bawadi Mall)? I forget my Eye Contact glasses on Aug21st, inside Mosque of Oman border post. If any one doing Exit/Entry? Mosque is just next to the Reception and you can could ask them. If you find, I could arrange to pick glasses with you. Small Reward $$ with Big smile for you in advance. Would be a great help. I really love those glasses. Thanks Ahmed for reading this and taking quick proactive action. Thanks Ahmed again for your help. Im working in Dubai, mine is Sales Visa, Im just planning to visit Oman for 5 Days. Since i checked with few people they are saying Sales visa is not allowed to enter Oman by On road visa. Which is the other suitable way , and how much it will cost. In need to cross border only via road since i need to visit Buraihmi. i am a german citizen and my 90 days tourist visa expires on 25 of September. i would like to fly to india from 22 to 26th of September. 1. Is a visa run(renewal) also possible by flying out and back to the uae? 2. If yes, do i get another 90 days? i want to go with my family 22nd September 2015 (Eid occasion) for muscat tour,which way is better hatta oman or al-ain route and is there any exit fee from UAE border. my visa validity only 5 month left is it ok.
what about car insurace cost for Nissan Tida. and if get Exit stamp from UAE and i did not get visa on arrival from Oman,can i re-enter same time to UAE. I just loved the post. Nice stuff. My daugter started working as a teacher in Sohar, Oman two months ago. She wishes to visit me, working in Abu Dhabi over the Eid period. She has a work permit and Omani visa. I have an Abu Dhabi visa and UAE ID. She will travel by bus. She was told that she cannot cross the border because she has not been there for three months. I have a permanent residence in Abu Dhabi. Can you please assist us. If she can cross, where would she apply for a visa. We are both SouthAfrican passport holders. Thank you very much for your help. We are desperate. Nobody gives the correct information. Okay,so I’m currently on the 90 day Long term visit single entry – Tourist Visa and would be expiring on the 6th of December 2015. I would require to extend my visa or get a new tourist visa/visit visa for 15 or 30 days. Is it possible to get either of the above done by exiting to the Oman border and re-entering UAE? I have an Indian passport. We are planning for a visit to Oman with my in-laws, we are having residence visa but my in-laws having visit visa. Is that possible for them to travel to Oman with UAE visit visa? I am a Indian passport holder and have UAE residence visa, sponsored by my Husband . By profession he is an advisor and we are planning to go to Oman for vacation by road, he often go to Oman for work so he can get visa on arrival but can I also get Oman visa on arrival/entry? now i am working in RAK. (Indian),my profession is Assistant Accountant and they are not allowing me to enter oman, is it ok with profession HR Executive to enter. Kindly contact the Oman embassy or border administration for an exact reply on your enquiry. Usually management position visas have clearance, but you will have to confirm that with the above mentioned authorities. 1. Am i allowed to exit to Oman and wait for my wife to process my visit visa for Dubai? 2. Do i need to get a visa for Oman as the visit visa for Dubai will likely take 3 days processing? 3. Can my wife apply a 90 days visa for me? 1. you will not get a “on arrival” visa for Oman. How much does the Oman visa for cost? I have read it is AED 200 per person? At the border for Oman should you be honest that you are doing a visa run? I am taking my parents and wife who all have british passports and want to extend their 30 day tourist visa. I do a visa run monthly for me and my son. It costs 33 AED per person to exit UAE and 50AED to enter Oman. Be honest and tell them your on a visa run. It’s free to exit Oman and enter UAE. I assume when u say visa run, u get a 30 days visa upon arrival once u head back to uae custom from oman right? Is this process still valid right now? Great article. One update (I did the trip today): The Oman border post is now 25km towards Sohar instead of half km. Only your employer can request that for you (visa change from tourist visa to work visa) if he doesn t want to spend money on your return (to uae) flight ticket. Please be informed that overstaying your tourist visa may result in a big fine. You must have crossed through a different border point. You are welcome to compare your gps coordinates with mine. I have UAE residence until 2017 and sponsored my cousin from Ethiopia for a 30 days Tourist visa. Can he do the visa run in Oman? Since I did not see Ethiopia in the list. I was concerned. Please help. Sponsored visit visas can only be extended at the proper authority only in special cases. Contact them for more details. I’ve heard rumors about expats with tourist visa cant be issued UAE visa (tourist) if you had gone exit Oman. What was confirmed was the news about Kish & Quesem. Is it true the boarder is not allowing expats with tourist visa to enter UAE? People are advising us to go South East Asia for exit. As far as i know visa runs will not work to extend your tourist visa. However, immigration regulations change frequently so i would advise asking the correct authority for a proper and updated answer. I m pakistani. I m on 90 days tourist visa and i got a job , the company has given me pink paper employement visa in original . i need to exit and re enter . can i go by car to kalba area and do visa run ?? i hv UAE driving licnce with car . the other option is by air . but i find driving more cheaper . I am going to do my visa run next week. Can someone advise me if the fees are still the same. I changed my job and my family(wife and a Son) visa were cancelled, now my employer stamped my visa on passport and now I applied my family residence visa and i got the pink paper visa for family. Visa status change will cost me 1000 dhs for two members. so i was thinking to go for Oman visa run. My family is Turkish nationals and they exceed 3 days after 30 days grace period. is it possible for us to go Oman visa run? Iv done visa runs a couple of times before i got my residency, but now Ive have heard recently that the they are no longer allowing visa runs through Oman border. Is this true ? I have residency, but my wife is coming to visit for a couple of months ( British Citizen). Has any one done one recently ? can anyone confirm this ? Hey Mo, have you managed to find out if oman visa runs are still ok? Hi ryan . This a special case .i am egyptian and i canceled my residence visa under the sponsership of myhusband and he dis the same .now i got the pink work visa . And my babies have american passports . Now can i go tohe borders with the babies and do the run with them as they will exit with their canceled visa and will enter with the stamp as touriest visa . Can i go out of the counttry with the pink paper ? I did a visa extension until July 3rd and now would like to go and do visa run at Oman border. But do I have a 10 day grace period with this extension or not. Does anyone have an idea. I was going to do it 3 days before the expiration day. Also are the borders open during Eid holidays. Me and my Wife like to go OMAN( RUWI) for 3 days visit by bus from Abudhabi, where i got bus & how much charge for bus tickets, and what is procedure for visa. 1. Is visa-run to Oman (via Al Ain) still possible? 2. Is it true that the border is further now (25 km instead of 1/2 km) ? 3. Will I still be eligible for a 10 day grace period upon re-entering UAE from Oman? A small query; i am an Indian passport holder with Qatar residents permit. I am planning to travel UAE by road coming weeks. So would like to visit Oman as well. So can i use same eVisa which is issued 1st time them exit to Oman using this border, and stay 2 to 3 days in oman them returned to UAE using same eVisa ? Or shall I request again for another eVisa to enter UAE? Can you please advise me steps what i have to do visit Oman from using Qatar residents. I am looking at doing a visa run with my wife. I have a UAE residency and we are waiting for her to start a new job before she has paperwork. We are looking at doing the Visa run through Mezyad border, Al Ain. I believe some of the rules have changed recently and you cannot take a rental car through. So my question is, is it feasible to go into the border control office and leave UAE/ enter Oman, and then leave Oman/ enter UAE in one go? Will this arouse suspicions from the border control authorities? Can you advise my wife and children having visit visa of uae for one month and i want to change them to residence visa. We are planning to go to Oman by road and stay for three days .what are the requirements and visa fees to Oman for that. I am holding Abu Dhabi residence visa and designation is INSURANCE CLERK. And holds Indian passport. As iam travelling to Oman from Abu Dhabi on short weekend. Can I get visa on arrival at boarder or do I need to pre apply for Oman visa. Kindly advise me. Hello. . .ahmm is it needed to pay for oman visa??? Or what??? Do i need to pay for the oman visa? ?